"Brewed with hefty amounts of European malts and four kinds of American hops, it delivers a blast of hop aromas, a rich middle of malt and hops, and a thrilling finish. It weighs in at 6.5 % alcohol by volume. Why squeeze such a big brew into a little can? Because we think fun in the great outdoors calls for great beer. Our cans go where bottled beers can't, where flavorless canned beers don't belong. 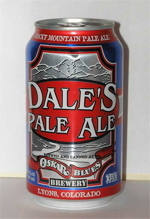 And no matter where you drink Dale's Pale Ale, our can protect it from light and oxidation far better than bottles do. From the can, it pours into a beautiful medium clear caramel color with a fantastic two-finger fluffy, pillowy head with a nice off-white hue. Still body, but holds up the head providing great retention, and the sticky top leaves very impressive lacing on the glass. The nose picks up flowery hops with great notes of citrusy sweet grapefruit, accompanied by light grains with a buttery smoothness. Initial taste gives a harsh bitterness with a creamy mouthfeel, and it shifts to a buttery light sweet finish, although it does have a nice dry bite at the end. Medium bodied, it's very hearty with a creamy mouthfeel and a dry texture. This is the third beer we've had from Oskar Blues, and its the third beer we've had from them that we've been impressed with. Regardless of whether they're canned or bottled, the beer inside is fantastic. Nicely hopped-up, but remaining balanced, it's all carried by a creamy mouthfeel that coats and satisfies. Reviewed on October 18th, 2007.